I dusted off my Bloomin' Beautiful set, and put it to work with today's SCS Sketch 227. I can see using this sketch for many images. I stamped the flower from Bloomin' Beautiful on watercolor paper in Black ink, then colored using the Marker Watercoloring Technique. The background panel was embossed using the Harlequin Texturz Plate. The sentiment is from Great Friend, stamped in Black on watercolor paper, punched with the small oval punch. 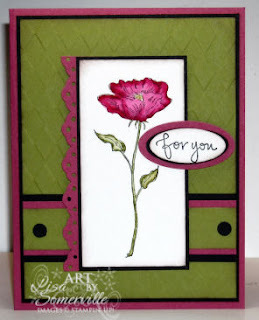 I did punch 2 Black ovals and layered those under the stamped image then onto a Large Rose Red Oval. That is absolutely gorgeous, Lisa! Wow!